First Morrissey canceled on Jimmy Kimmel because he refused to share a stage with the Duck Dynasty stars. Then Kimmel went on air and made fun of Morrissey, because he “keeps finding ways to depress us.” (There was also a fake Dynasty clip in which they go vegetable-hunting.) Now Moz has predictably fired back with a statement that references obesity, mental health, Sandy Hook, and the meaninglessness of the Jimmy Kimmel show. 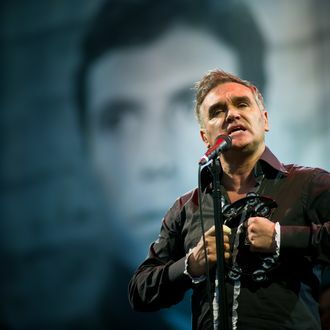 Also, in case you missed it, a quote from Morrissey on war: “If more men were homosexual, there would be no wars, because homosexual men would never kill other men.” Morrissey: still very good at being himself. UPDATE: Jimmy Kimmel invited Morrissey to come on the show and discuss the issues. “ I’m an open, even-handed person, and I consider all points of view.” Meanwhile, Morrissey said some semi-rude things about Paul McCartney, because Macca is friends with the Royals.